Dubai, UAE, June 12, 2017: In this holy month of Ramadan, Skyline University College Community Services Committee headed by Dr. Mohammad Abdul Salam has organized an Iftar Dinner for its students, alumni, parents, faculty and staff along with more than 200 Sharjah laborers who were also invited to play a cricket match under the floodlights of SUC cricket ground on June 7, 2017. People gathered just in time to break the fast period of the day inside the SUC premises and enjoyed sumptuous meals. 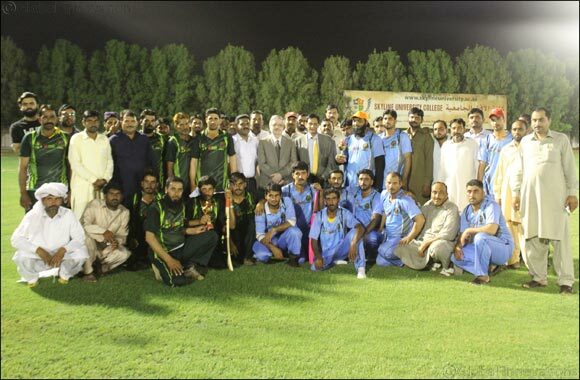 A cricket match between Sharjah laborers was played as a way of recreation and celebration after a hard day’s work and long hours of fasting. SUC recognizes the hard work and sacrifices of the laborers to provide for their families each year and in return, the Iftar dinner is being organized every year. The SUC Iftar gathering was conducted in line with SUC’s commitment to UAE’s Year of Giving that extends to all people regardless of their social background. The purpose of the event is not only giving back to the society but also teaching SUC students and the whole SUC community the value of helping the needy and working together as one to promote good humanitarian activities inside and outside of the university. Through SUC’s conscious effort to promote social awareness and responsible social involvement, the Iftar dinner and cricket match have brought together Muslims and non-Muslims in a memorable, traditional Ramadan gathering.